January | 2010 | ___is black the new black? 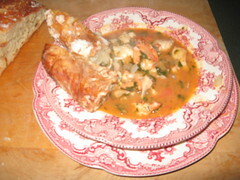 As a result of the recipe organizing project, I became reacquainted with the fish stew creation posted on Chicagoist. 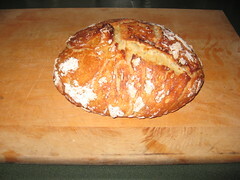 I also decided to make a loaf of the No Knead Mark Bittman bread. So, this was my second time making the stew. I ended up using about a pound of Tilapia and a half pound of shrimp. On the advice of a friend, I opted to use some cilantro in lieu of the celery and a little bit of lime. I think I may have overdone it with the lime, but it was really quite wonderful. The bread is apparently impossible to mess up because I thought the water I added was too warm and I was afraid I’d killed the yeast. No problems. My kind of recipe.